The PS3 is getting free launch-day Assassin's Creed: Brotherhood DLC that will see Ezio murdering in the name of astronomy. Historical figures, such as Leonardo Da Vinci, have been featured in past Assassin's Creed titles, and Assassin's Creed: Brotherhood is set to add another to the roster. The PlayStation 3 version of Brotherhood will be getting free launch-day DLC called the Copernicus Conspiracy that is focused on Nicolaus Copernicus. Copernicus was an astronomer that lived from 1473-1543 and is known for proposing a heliocentric model of the universe. Up until his time, many believed that the Earth was the center of the universe and everything in space was revolving around it. Copernicus assumed that the Earth and other celestial bodies revolved around the Sun instead. He was right, by the way. The DLC will bring Ezio, Brotherhood's main character, into cahoots with Copernicus. In the game, Copernicus is being attacked for his heliocentric model and he apparently isn't going to be nice about straightening things out. 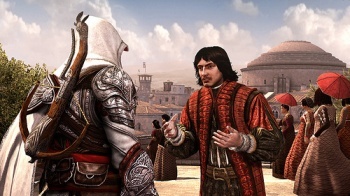 Ubisoft says that Copernicus will give Ezio extra jobs including courier, assassination and protection missions. Ezio is becoming the Forrest Gump of his time. I always think about revolutionary historical figures as men or women that somehow defied their overwhelming detractors through peaceful means, but I doubt it was that easy in all cases. Maybe a few times they had to, you know, kill a guy too. Assassin's Creed: Brotherhood will be available for the Xbox 360 and PlayStation 3 on November 16, with the Copernicus Conspiracy available the same day on the PS3 for free.